Elon Musk isn't the only one venturing below Earth's surface. It can seem as though every square inch of planet Earth is colonized, cultivated, or otherwise utilized by humans and our endless variety of projects and needs. Even Earth’s orbit is rife with our creations, our presence, and our detritus. Of late, Elon Musk and the Boring Company have delved underground to develop the little that is usually left alone — and the Defense Advanced Research Projects Agency (DARPA) has recently joined in. At the end of December, the agency announced its latest contest, called the Subterranean or “SubT” Challenge. Contest participants will develop systems that could help humans to map, traverse, and search through underground locations that would otherwise be too difficult and dangerous to enter or explore. While some might be quick to liken this contest to Musk’s Boring Company, the intent of the project is not to build tunnels for citizens to move through, but rather to develop tools and methods of understanding that will give us the ability to know more about what’s below. This will allow those responding in emergencies like earthquakes and other seismic events, sink hole collapses, and war to better help those in need. 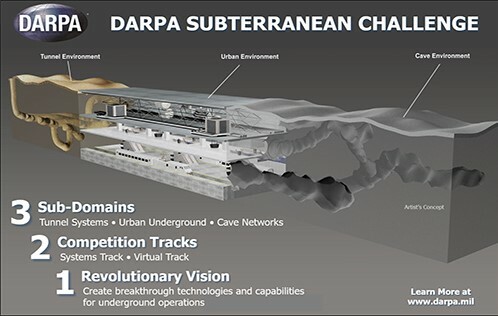 DARPA’s SubT Challenge will incorporate innovators from all over the globe. Participating teams have the option of pursuing either of two separate tracks: a Systems Track, in which they would develop hardware-based solutions for an actual, physical underground course; or a Virtual Track, in which the team would develop software for a virtual course. The preliminary events will feature circuit challenges in three different environments: a network of human-made tunnels, a subterranean municipal-transit system, or a networks of natural, underground caves. During this final leg of the contest, planned for the year 2021, participating teams will have to complete a challenge that incorporates elements of all three environments. The winner of the Systems track will take home a $2 million prize, while the Virtual winner will get $750,000. In a disaster situation, there may be a host of changing and surprising variables. From the after-effects of a seismic event to unexpected debris and materials, below the Earth’s surface is a complicated, other world. If this challenge is successful in eliciting innovative and novel strategies for managing and exploring below, future disaster relief, new construction, and even transportation — like the high-speed train and hyperloop tunnels already under construction — could greatly benefit.